BuildBlock, the Oklahoma-based ICF company, is now molding more products in more areas. The flagship product, BuildBlock insulated concrete forms, continues to be molded in 15 locations across the U.S. and Mexico. BuildBuck and BuildDeck are now being made in a number of locations as well. BuildBuck, introduced in 2016, has taken off dramatically, says Mike Garret, BuildBlock CEO and founder. Initially manufactured at a central location, it is now produced in three facilities across North America and stocked in all facilities. BuildDeck is also seeing a nationwide manufacturing rollout. Primarily manufactured in Missouri, BuildDeck is now available throughout North America through new manufacturing in Massachusetts and Idaho. In 2003, the Italian government gave permission for her team to take core samples from a marine structure in Portus Cosanus, Tuscany. Electron probe microanalysis and spectroscopy revealed unexpected crystallization. Unlike modern cement made from lime, Romans made concrete using volcanic ash. Jackson’s team found that this type of marine concrete used by the Romans—a mixture of volcanic ash and lime—actually became stronger when immersed in the ocean. The salt water partially dissolves the ash and lime cocktail, and in the resulting chemical reaction, new interlocking crystals and minerals form, preventing cracks and making the structures stronger. Jackson, a research associate professor at the U.’s Department of Geology and Geophysics, co-authored a paper on the results which was published this summer in the journal American Mineralogist. While the Romans’ exact recipe has been lost, labs now have better information when they try to recreate it. “The Romans were very good at selecting volcanic deposits, and that’s something modern concrete manufacturers are doing now, but they need more guideposts to find out what’s best for productivity,” Jackson said. 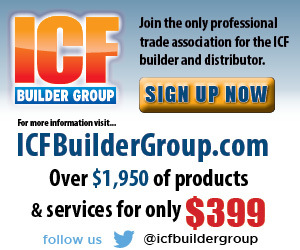 ICF Builder Magazine recently launched a new, improved website with more content and better navigation. The new website includes a directory of ICF dealers, designers, and installers, as well as past winners of the ICF Builder Awards, construction information, and a comprehensive listing of benefits. The new site can be found at www.icfmag.com. This spring, U.S. Department of Labor issued a ruling aimed at better protecting workers from respirable silica dust. Silica—basically sand—is a major component in cement, concrete, drywall, and other construction materials. Cutting, chipping, drilling and grinding materials these materials can generate silica dust that is hazardous for construction workers. Damage from inhaling the dust is one of the oldest known workplace hazards. Because the particles are so small, they can penetrate deep into the lungs, causing diseases like silicosis, lung cancer and kidney cancer. About 2.3 million people in the U. S. are exposed to fine grains of silica on the job. The ruling dramatically reduces the exposure limits for workers. OSHA now enforces a reduction in silica exposure for an over eight-hour day from 250 micrograms per cubic meter of air to 50 micrograms. The ICF Manufacturers Association (ICFMA) and the ICF Builder Group have partnered again to host an ICF Summit at the World of Concrete trade show. The event will consist of three independent education sessions. On Tuesday, the two-hour class will educate commercial contractors on how to get involved with ICFs. The Wednesday class will be geared around sustainability and residential green building, while the final class on Thursday morning will focus on marketing disaster resistance and safe rooms. To register, visit World of Concrete’s website at www.worldofconcrete.com. An ICF company based in New York state now offers to panelize ICF walls on commercial construction projects in the region. Michael Cleary, company president, says his panelized ICF building concept is set to revolutionize commercial construction. The patent-pending system is already in commercial use in select markets, and offers a host of advantages over stacking walls on site. Cleary points out that wall sections are built indoors, in a controlled environment, which reduces waste, speeds construction, and eliminates weather delays. On multi-story projects, walls can be stacked in the warehouse before the foundation or floor is in place. ICF Panels are delivered to the jobsite ready to be braced and poured. Bucks, weld plates, and lintel rebar are installed prior to shipping. The majority of the reinforcing steel is replaced with Helix steel fiber, which ensures better consolidation, smoother pours, and stronger walls. Helix will be shipped to the jobsite along with the wall segments to ensure availability. Panels are set into place with a lightweight sign crane, then braced and poured onsite. 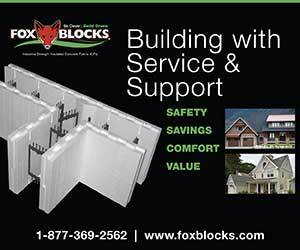 ICF Panels makes it possible to build walls in hours, rather than days. Project timelines can be shortened, reducing the construction loan. And earlier opening dates put money directly into the developers’ pockets. 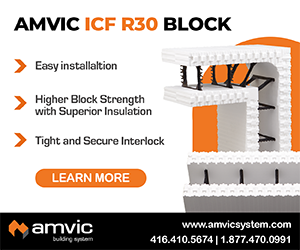 Cleary says the company will work with all major ICF brands, and has a number of projects underway in the New York City area, including 350 Clarkson Ave., an eight-story, 250-unit mixed use building.